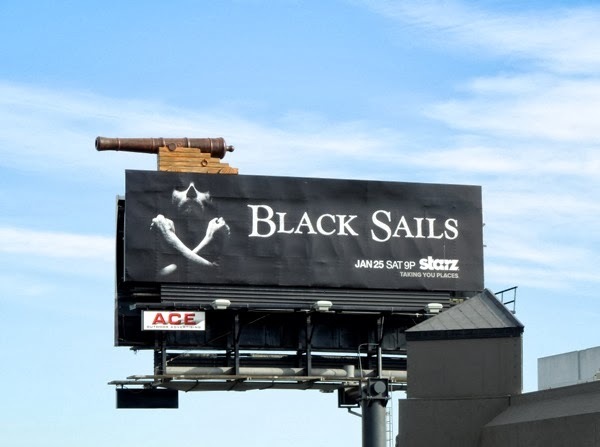 Happy New Year and what better way to kick off 2014 than with this dramatic giant teaser billboard for Starz new drama on the high seas, Black Sails. 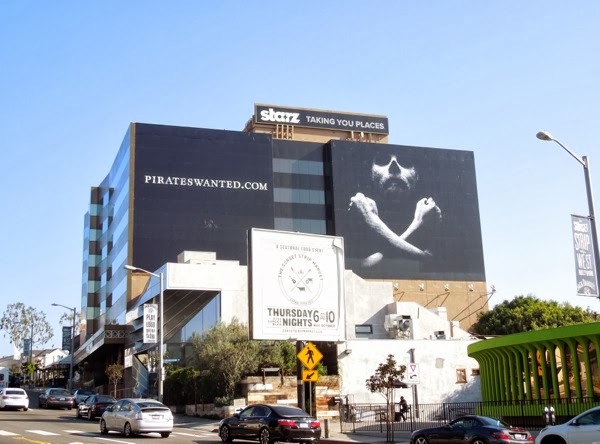 The super-sized billboard which was first snapped along L.A.'s Sunset Strip on December 22, 2013, almost looks like some anarchic protest call-to-action, or rock band album cover, with its simple pirateswanted.com website name and the clever take on the traditional 'Jolly Roger' skull and crossbones imagery. 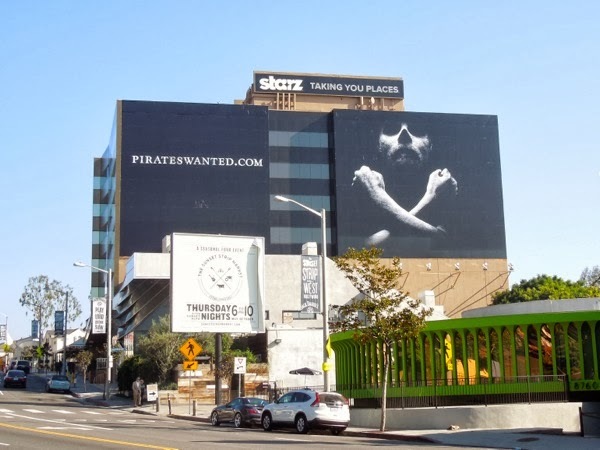 Interestingly the 'Starz Taking you places' slogan above the billboard had been blacked out in subsequent days, obviously to perpetuate the mystique of this evocative teaser, but then reappeared under the website name (spied on December 30, 2013), which frankly spoils the overall effect. 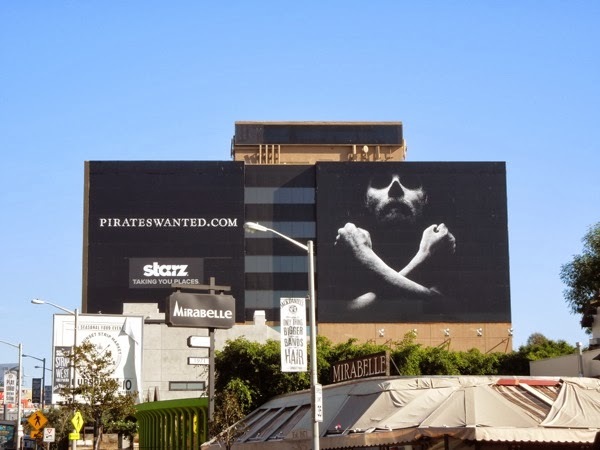 This mysterious advertisement certainly makes a big impression for this original prequel series inspired by Robert Louis Stevenson's classic novel Treasure Island, which takes place in the Golden Age of Piracy. 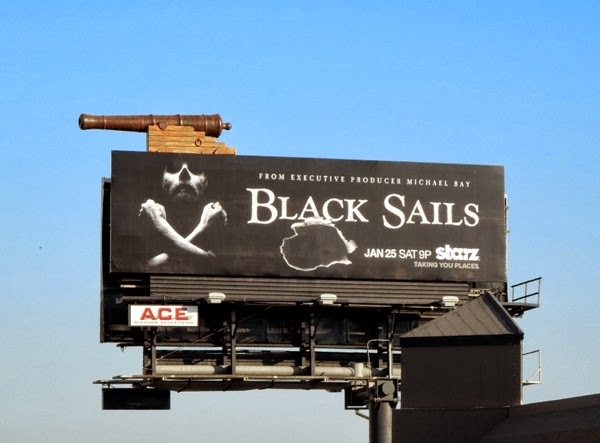 Toby Stephens stars as the feared 'Captain Flint', whilst Luke Arnold brings the infamous 'Long John Silver' to life for a new generation, as they fight for the survival of the notorious criminal haven, New Providence Island, a debauched and brutal paradise teaming with pirates, prostitutes, thieves and fortune seekers. 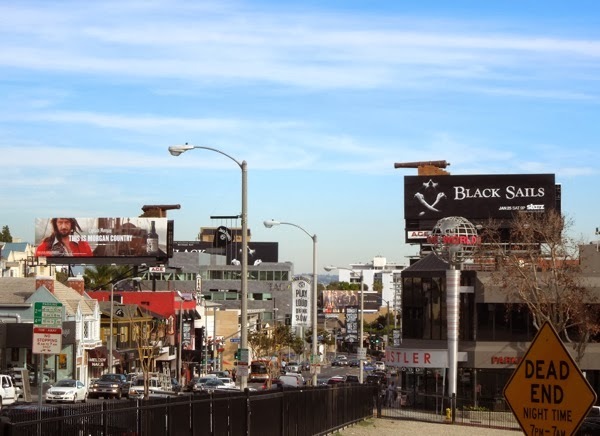 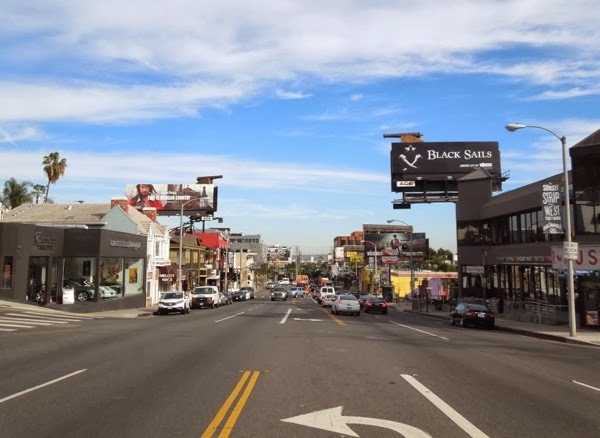 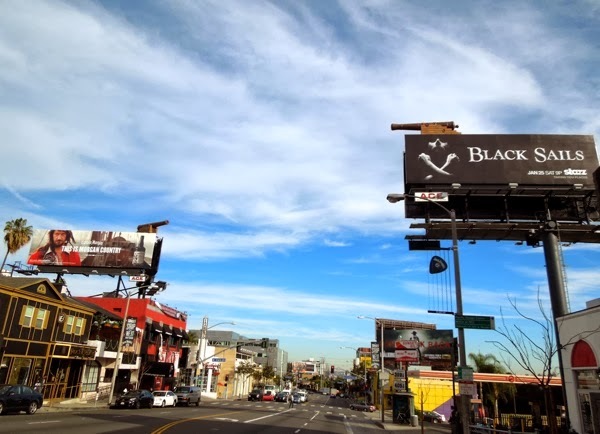 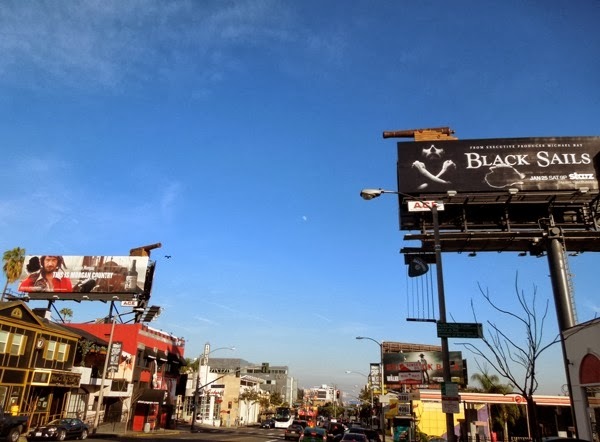 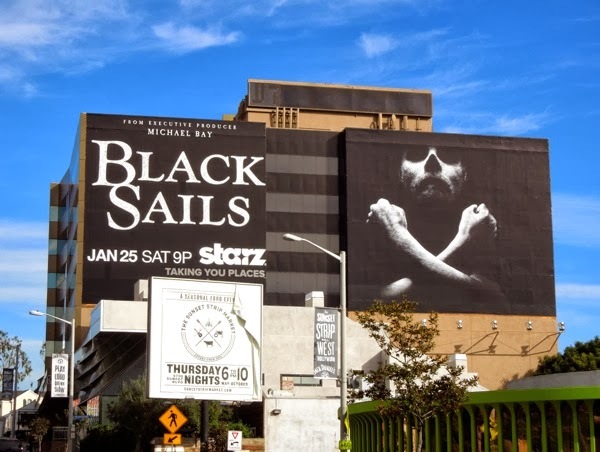 Here's also a standard landscape billboard for the new Starz series, snapped further west along Sunset Boulevard on December 31, 2013, and sporting the show's title, Black Sails, plus the skull and crossbones imagery. 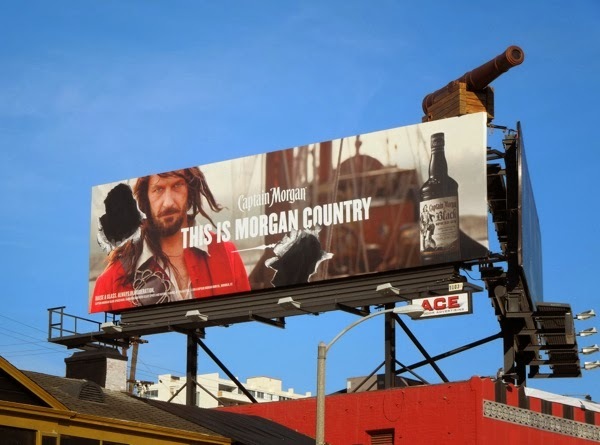 Daily Billboard also wonders if the designer of this ad creative was a fan of the British rock band, Queen, as this pose also resembles Freddie Mercury in their classic Bohemian Rhapsody record cover. 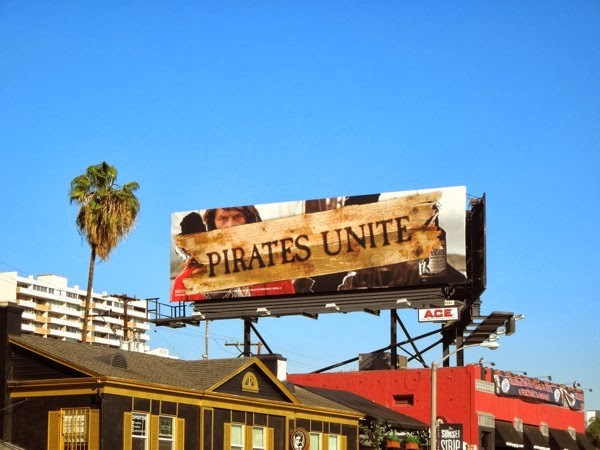 If you're a fan of pirates, you may also want to check out these other pirate-themed billboards and these cool original costumes and props from Disney's Pirates of the Caribbean films. 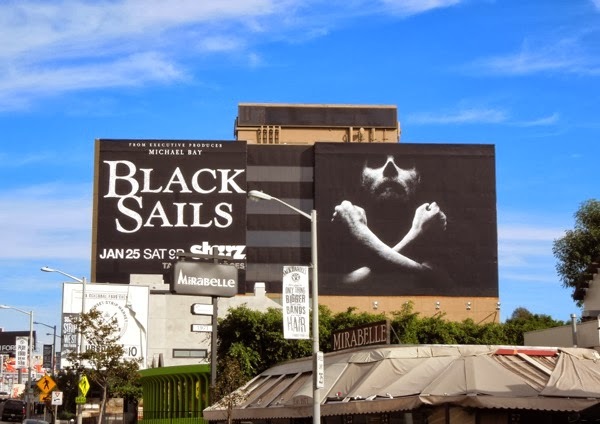 Are you ready to set sail for another epic voyage of discovery with Daily Billboard this year? 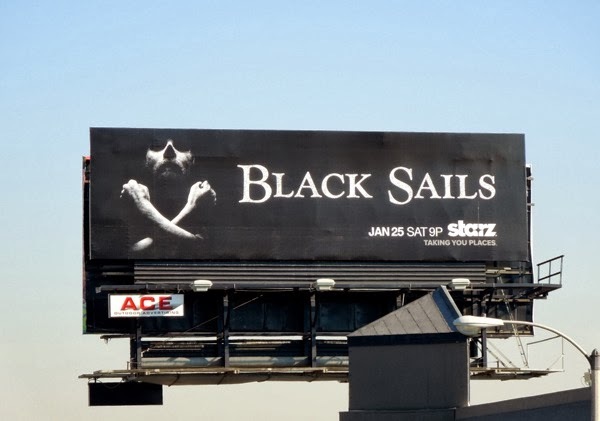 UPDATED: Now that Starz has done teasing us, it looks like it's time to unfurl the sails all the way for this new series. 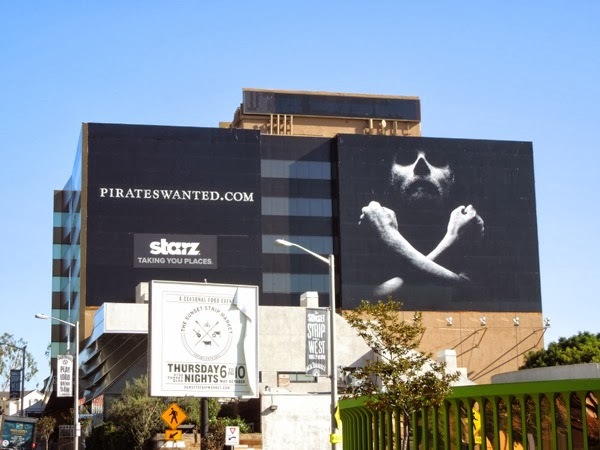 On January 6, 2014, the giant-sized billboard along Sunset Strip had done away with the pirateswanted.com faux recruitment website and had the show's full title, big and bold, plus some major producer credentials in the form of Michael Bay. 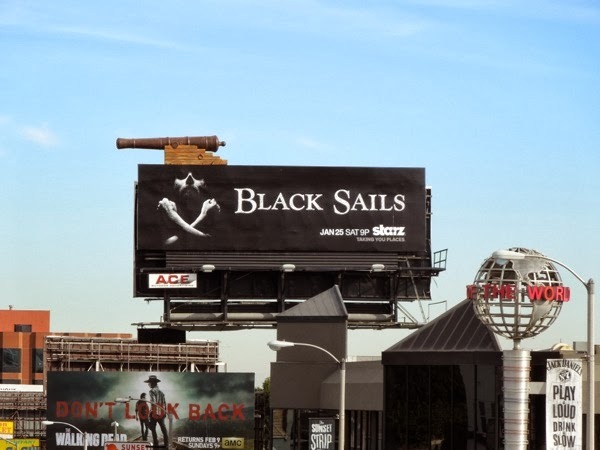 Further west along the Strip, Starz has pulled out the big guns to promote their new pirate series, with this special cannon installation on either side of the road. 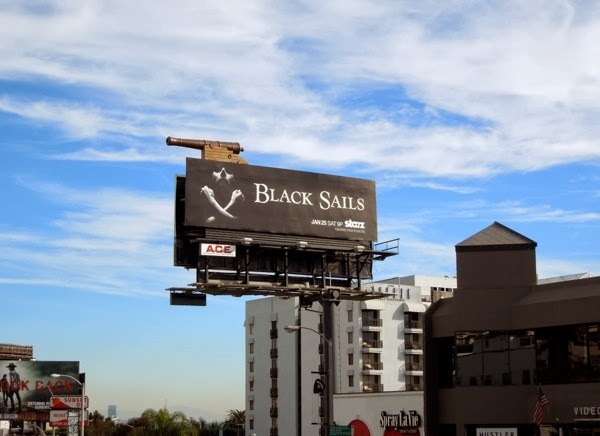 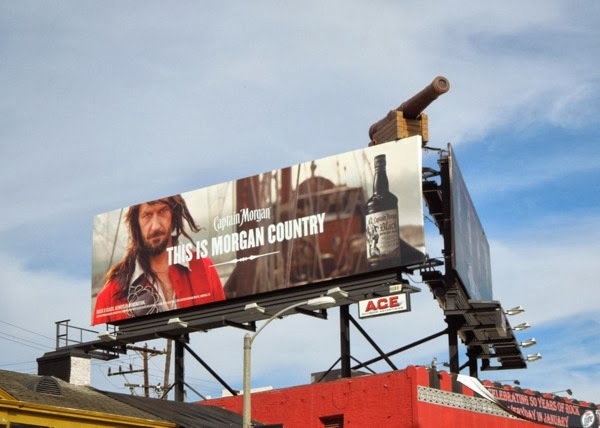 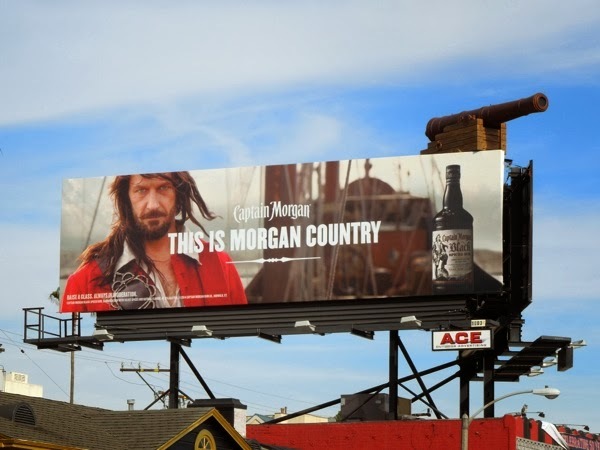 It looks like Captain Morgan rum may be a promotional partner or sponsor of the show, which is a great fit (if a little on the nose), and their pirate-themed ad can be found on one side of the street with its cannon pointed, as if on the prow of a ship, and the other cannon is mounted on top of the billboard for Black Sails. 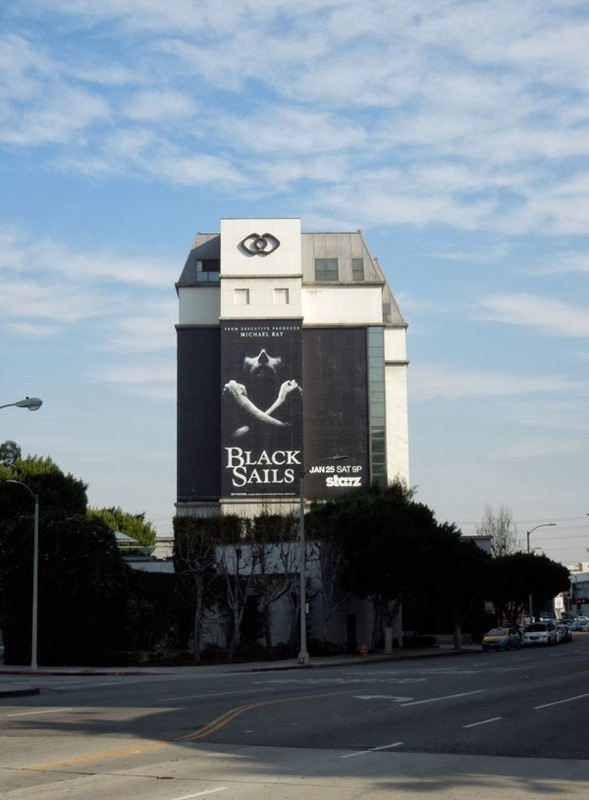 It's like two pirate ships preparing to fire on each other and have a cannonball fight on the high sea. 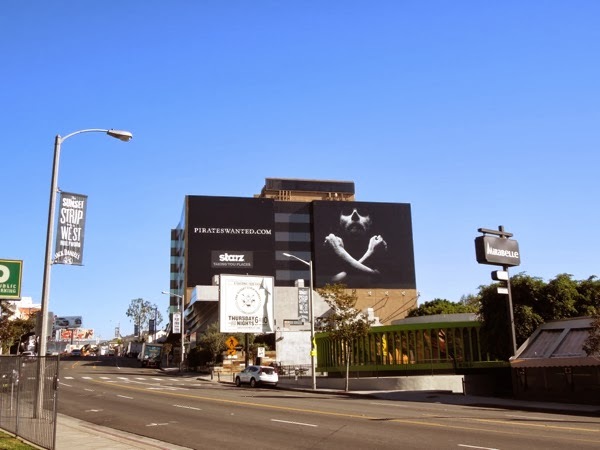 These canons certainly are eye-catching as you drive or walk along L.A.'s Sunset Strip heading east, even if the execution lacks an overall cohesion with the two differing ad creatives. 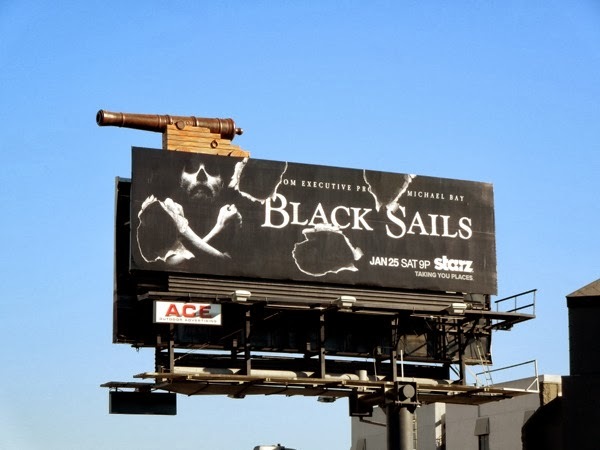 This clever installation is still a great way to start 2014 for out-of-home advertising and this dueling ship's cannon gimmick will certainly be considered for a BAB Award this time next year. 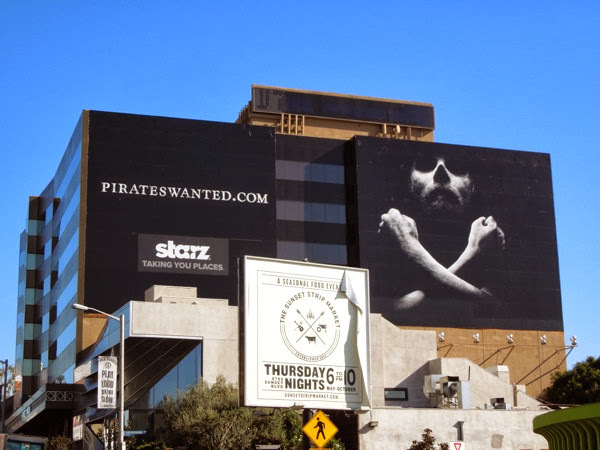 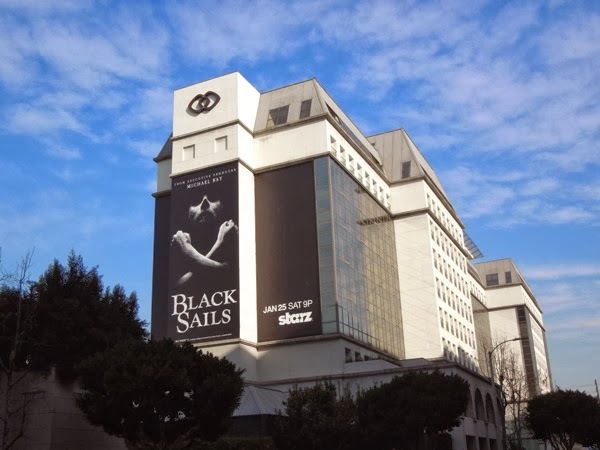 UPDATED: Here's more proof that Starz isn't skimping on the advertising support for its new pirate-themed series, with another stand-out giant-sized billboard spotted along Beverly Boulevard on the side of the Sofitel Hotel on January 8, 2014. 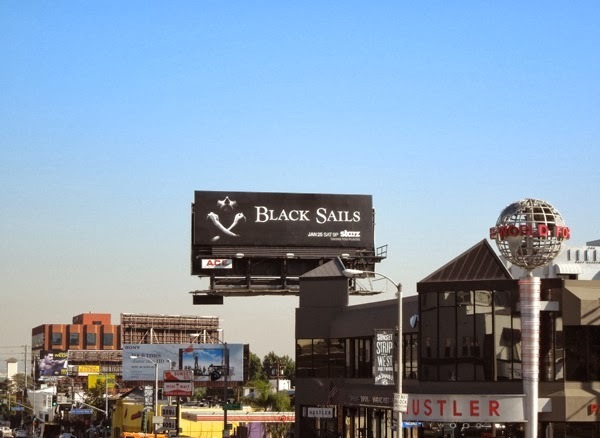 UPDATED: It looks like Starz has a few more tricks up their sleeve where their dueling cannon billboard installation along the Sunset Strip is concerned. 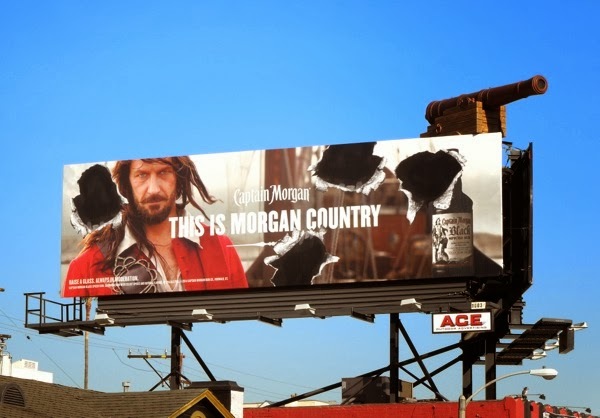 These holes in the billboards have appeared, snapped on January 10, 2014, no doubt caused by a fierce cannonball fight across the road. 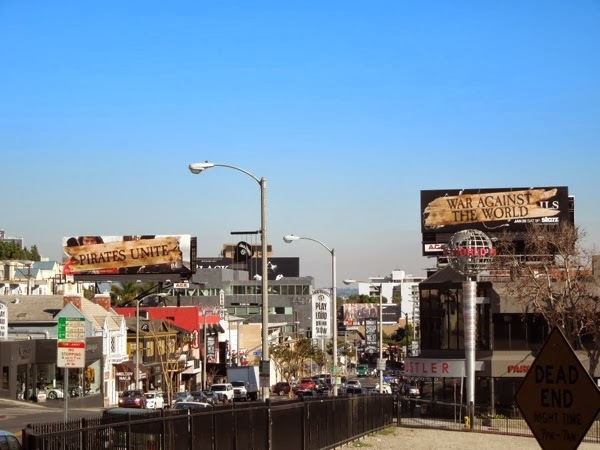 It's a very clever way to keep passersby engaged day after day. 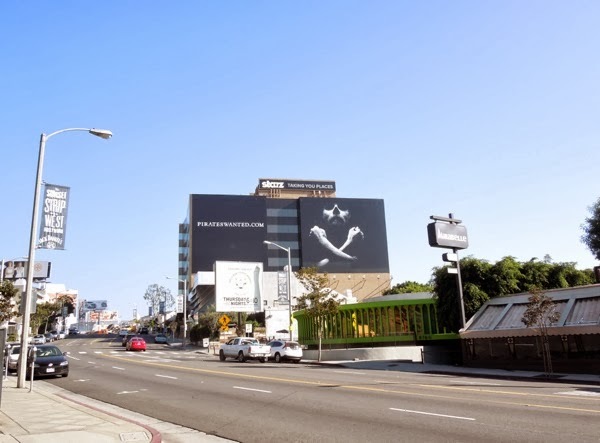 UPDATED: Just when you thought the fighting was over, more and more cannonball holes appeared in the billboard creatives, snapped on January 15, 2014. 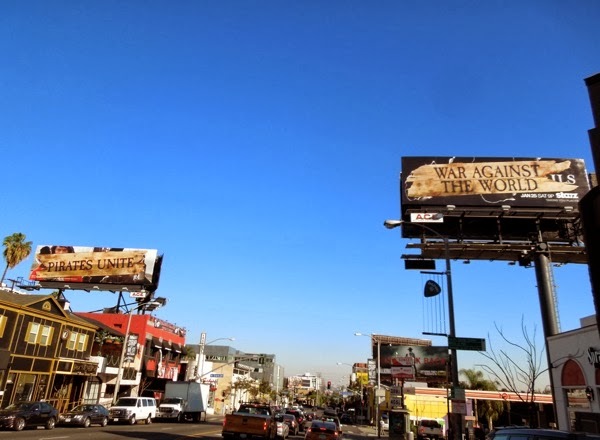 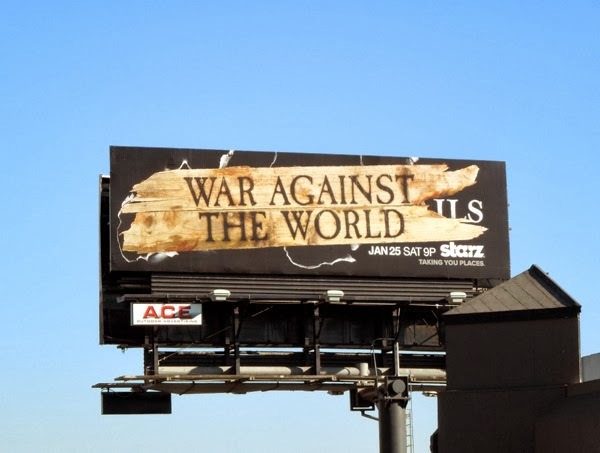 The next day, yet another development had occurred with a new driftwood message spreading across both billboard sites 'Pirates Unite - War Against The World'. 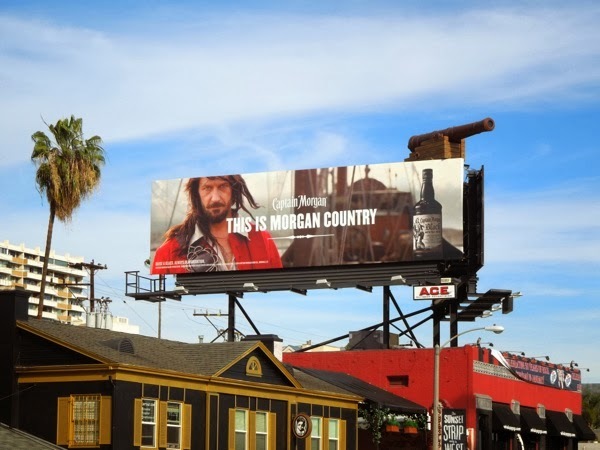 The question is, is this the last gambit in this captivating ad campaign, or is there still more to come before the new series airs?